Orchids are a wildly variable, beautiful, and unmatched type of flower. They are valued worldwide for their unmatched variety and beauty, which makes them a great option for any homeowner looking to elevate their indoor or outdoor home garden. At Wagner Greenhouses, your premier source for Minnesota orchids, we provide a wide and ever-changing seasonal selection of the beautiful plant. The orchids found at our greenhouse are turgid, pest-free, blemish-free, and with lustrous, well-cared for flowers. Come take a look at the seasonal varieties we’re currently carrying anytime! In order for their flowers to bloom, all variety of orchids need to receive enough light. You’ll know your orchid is receiving enough light if their foliage is light and yellow-green, with strong upright growths. Long story short: give them a lot of sun without setting them on proverbial fire. 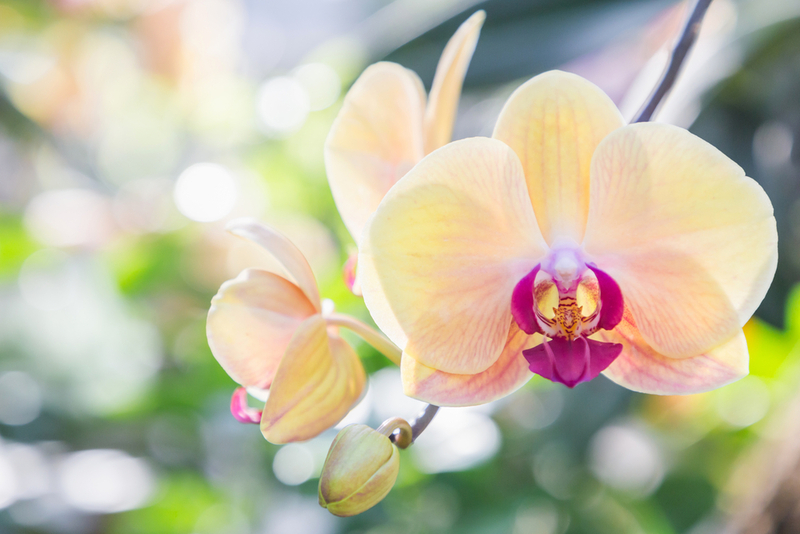 Orchids need a lot of air to thrive, which is why you’re never supposed to plant them in soil. What you pot orchids in should be open, with good drainage – collections of materials like bark, charcoal, and moss work best. Finally: water. Overwatered orchids suffer root loss until they can’t absorb any more nutrients, grow weak, and die. There is no golden rule other than water them as they dry out. You’ll be able to tell when a potted orchid is dry via a few signs, including if the surface of the mix appears dry, if the pot itself feels lighter, and if a skewer inserted into the mix will come out dry. When you do water your orchids, do so until it runs from the drainage holes of the pot you keep it in. Orchids can vary in size and weight from a few ounces to literal hundreds of pounds. Fossil orchids have been found that date back as many as one hundred million years. Orchids can be found growing on every single continent in the world – except Antarctica. There are almost five times the number of known living orchid species as there are species of mammals. The well-known flavor of vanilla actually comes from the seed pods of an orchid called Vanilla planifolia. Stop in today to one of our retail locations to take a look at the spectrum of lovely orchids we offer and talk to one of our service professionals about the variety that’s best for your home.